Time for a story about some monsters… but oh no, the book is too scared to tell the story. Can you help it feel better? It wants you to scratch its tingly spine, rub away the goosebumps, blow away the butterflies in its tummy, and much much more! 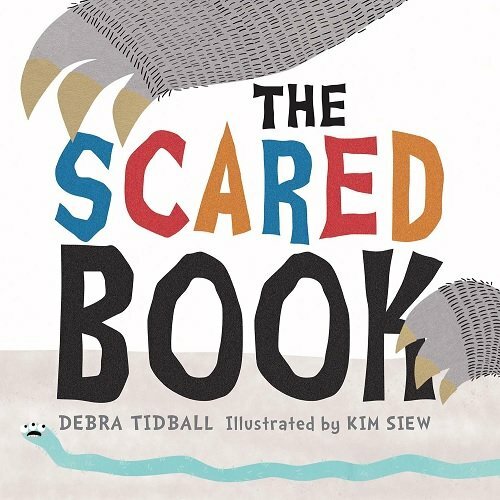 The Scared Book is an interactive picture book packed with fun and humour. What makes this book unique is that the book is actually a character itself, hence the title The Scared Book. While children are having fun interacting with the book, they’re also learning about the physical signs of feeling scared, as well as strategies to cope with these feelings (such as taking deep breaths, doing relaxation exercises, and facing your fears). The Scared Book has a lovely message of self-empowerment and children will feel a great sense of achievement after chasing away the scary monsters. The monsters in the story are a metaphor for the child’s fears. However, the brightly coloured monsters are more quirky looking than genuinely scary. The fact that children get physically involved with the story on every page makes this the perfect picture book for targeting action verbs. There are so many actions to do together, like ‘scratch’, ‘blow’, ‘flick’, ‘trace’ and ‘fan’. For further speech and language targets in 'The Scared Book', see the list below.